The implementation of project management platforms often suffers from being poorly defined, mismanaged, over budget, overdue, or any combination of these. Specifically, statistics shows that over 80% of software implementation projects are unsuccessful, poorly executed, or canceled before completion. What’s more, 30% of these failed projects never even got started because of having no change control system in place, inadequate requirements setting, poor testing and other reasons. And yet when organizations determine to putting in place and implementing project management tools, they do not anticipate failure despite the risks associated with such complex projects; instead, they plan for success, governed by their budgets, deliverables, executive expectations and go-live deadlines. Project management software adoption is assumed to take place as a matter of course, only to be frustrated by real developments in the company. How to avoid project management failures? There are no foolproof measures, but some ways are certainly sounder than the others. Here we undertake to review some of best practices for implementing project management software. In the process, we will cite three leading project management software—Wrike, Smartsheet and Monday.com—to illustrate key points. Tip: You can quickly sign up for a Wrike free trial here to use the features at no cost and commitment, the better to follow our guidelines below. Among project management software in the market, Wrike consistently places among the top brands. 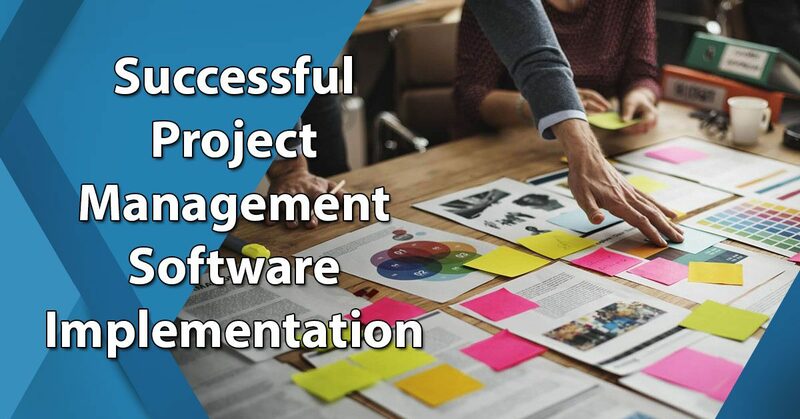 Implementing a new project management software must come from a definite business need, a solid value proposition, along with a gain or benefit after implementing the software. Typically this benefit will come in the form of a return on the investment (ROI) the company made to procure and install the software. Calculating the benefits of implementing software is always the first step; a definite business requirement has to be established before any idea of buying new software is laid on the table. To put it in another way, ask yourself: what is the purpose of project management software to your company? While personal decisions to purchase new systems may occur at the flick of a whim, doing so in business setting is equivalent to planting the seed of corporate suicide. What business would want that? Set up an evaluation team. Your evaluation team should include representatives from your company’s top management, key experts and the actual end-users. At this point, you may also consider bringing in a neutral consultant for additional inputs that your first members may overlook. Current processes and practices review. Looking at a new project management software and ways to successfully implement it means you are going to scrap or change those old ways by which your company do and accomplish things. Many companies have these processes on record, but if yours does not, then you need to list down all your current processes and how they are going to be affected once the new project management software is installed and running. Some of these practices will definitely fall by the sidelines, while some that proved successful in the past may have to be modified for much improved results. Shortlist your available solutions. Create a criteria to evaluate the available solutions and shortlist to the ones that are the most promising for your needs. Criteria can include feature sets, pricing plans, platform, and other things that matter to your users and objectives. The key is to establish a way to measure the importance of each item, so score each on the degree of importance to your business—5 for very important, 3 for important, and 1 for less important, for example. Assigning definite numbers to each item in your criteria enables you to find the total value of each and factor them in your final purchase decision. You may score the vendor for: industry expertise, support for multiple sites, support for your existing legacy systems, ease of migration, total cost of ownership (TCO), if the system is actively finding ways to integrate with other current and future solutions that you will need down the road, and customer support. Ask for or determine specific references. What you don’t want to do is rely on their words or head for vendor users who were pre-screened especially for new prospects. Check out independent user forums or specific case reviews. Or get them to provide you with client companies in your industry and try to set up a visit to get a solid input about the solution. Getting your hands dirty on background research will pay dividends in the end. How to start project implementation once the vendor is selected? First off, you’ll want to gather the team and set members with specific responsibilities. Overall project overseers. To ensure each part of the symphony is performing to part, you need to have a conductor oversee the overall process of implementation. The steering committee will have set up responsibilities to ensure each team is settled while being accountable and committed to execute a sustained operation of the project while actualizing its expected value. Aside from helping managers appraise how the project is performing, the project overseers should contribute to adjusting content and direction as required. In most project management implementation setup, this committee includes the project management office (PMO), the project manager, and those senior executives who should have a larger interest in seeing the success of the implementation. Organization-wide announcement. Once the project team is complete, get the entire organization aware of the whole undertaking. Beware of the lifeless, uninspiring memo: organize a special event worthy of the value of the project implementation. With Monday.com, you can configure settings right off the bat or as you go along to your specific needs. After the project management software implementation formal launch announcement, it’s time to get dirty with the work at hand. First off, you’ll want to get the business process experts and the functional leads gather together and work out the specific business processes to be considered in running the software. Here they can determine which processes should be retained, made more efficient, manage how processes affect other parts of the business, assess which ones have the most potential for generating revenue and making customers happy. After pruning or re-engineering the processes, get them to put everything in proper documentation. Once you have fine-tuned the business processes, it is time for the first software configuration out. This is where the functional leads transfer the business requirements to the technical team and the technical team begins the work of programming and configuring project management software to align with the business operations needs. Keep in mind this configuration should be largely representative of what the company needs to do to keep multiple departments involved in your business running. With the first run of the software completed, it is time to validate if the team is on track with its configuration of the software. Demonstrate configuration of the project management software then allow the users to complete the task individually. Be sure to provide a job aid and data sheet for each process to be tested so each user knows where to click and what the expected results are. Note all of the passes and fails of each step and also be sure to note any lack of functionality, software bugs or key usability issues. Make sure both the functional team and technical team are facilitating these sessions. At this stage, you have to conduct a thorough end-to-end testing of the software with the involved departments of your company. As before, ensure job aids and data sheets are used during the testing. Every end user should attend this session in person. After the system has been tested by the users, you may formally or informally have them “sign-off” on system readiness. However, should there be any issues uncovered during the UAT, complete one final round of software configuration before go-live. You will find many ways to work with Smartsheet project management software while testing it. Here you are either at the threshold of implementing your first project management software or executing the process of transitioning from one system to a new one. You need to create a plan to describe all tasks to be completed before go-live. This plan is designed to minimize the risks that go with first-time implementation or moving from one system to another. For developing a migration plan, identify those key activities well in advance so the project team can agree on the tasks and be aware of when they need to be completed. Also ensure there is a contingency plan in place should something go wrong during the final phase of transition, implementation process so there’s no need to shut down business operations. The moment your project management software goes fully live. Your business is now running full throttle on new engine. Here you should already have deployed the functional resources to key locations to provide on-site support at go-live. Providing in-person support for the users at this critical juncture hands morale boost for the organization and is key to the success of your project management software implementation. Sharing Wrike dashboard is one of the first productive actions you can do with this project management software. Despite going through testing previously, live operations have a way of springing up issues not available to you during the in-house testing period. If you want your project management software implementation successful in the long haul, you need to practice the virtue of patience and acute listening skills. Entertain and find a way to cultivate suggestions and create a positive feedback loop, run an internal staff survey one month after introduction, and again another three months in. Hearing the feedback of your team is essential to help you improve the implementation of your new software. Conducting a survey is an effective way to make an assessment of your onboarding process. The team can offer suggestions to help you realize how you can maximize the software to its highest value. Team members will also feel like their opinions are heard which can result to encourage them in becoming more engaged during the process. Are you ready to implement your project management software yet? If you paid careful attention to the items in our list, you should be standing on solid ground to have a go at it. Remember, these are some of the most dependable pieces of advice culled from actual practice needing just a few adjustments in your specific case. If you are like most of companies, you can also test-drive Wrike at no cost, which many find to have most of the features they need in their project management platform requirements. You can easily sign up for a Wrike free trial here. What Are the Most Important Skills of A Project Manager and Why?